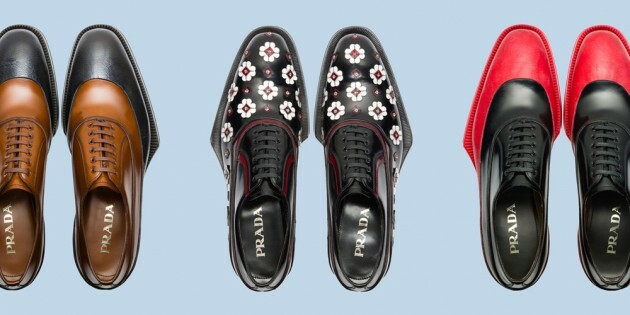 The new Prada Autumn/Winter Shoes are right up my street, both Mens and Womenswear! 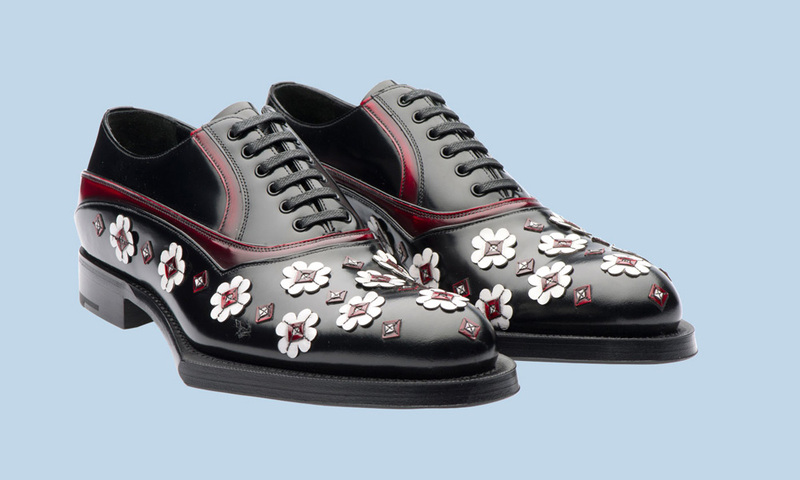 A lot of these beautiful shoes feature these incredible leather flowers sewn on and others have a 2 tone effect with a change of colour on the front and often also towards the bottom of the shoe! The Womenswear heels are super chunky and some have a large platform at the front!! These shoes in Womenswear fit into the androgynous and geeky trend and are simply breath-taking!! They may not be to everyone’s taste but I absolutely adore them!! Enjoy!! 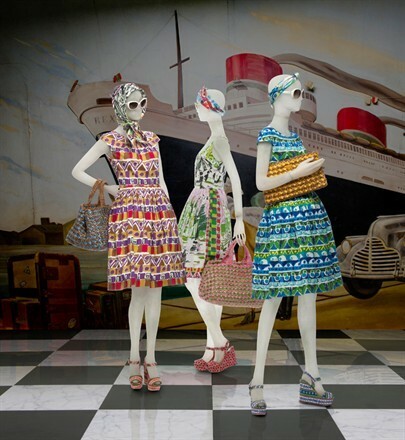 Prada’s fresh and new collection is the: LE VOYAGEUR!!!! 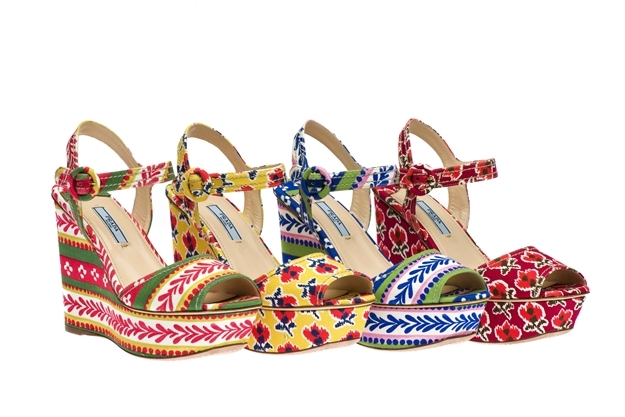 It’s simply beautiful and combines many influences from around the world such as ethnic brightly coloured prints and little coloured raffia handbags. 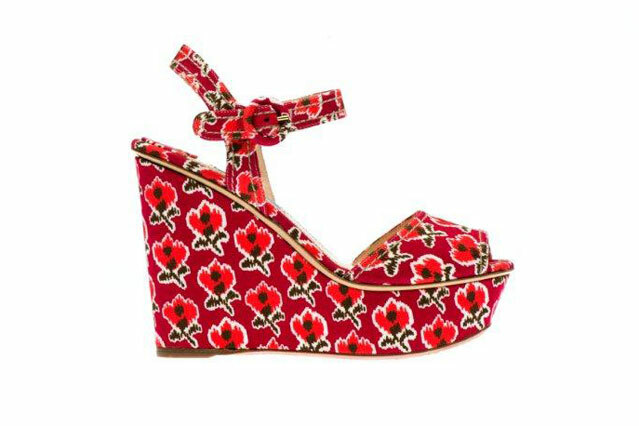 Prada has released this capsule collection full of fun canvas wedge sandals – which I adore, silk scarfs and cotton popeline dresses!! I have taken some of my favourite pictures of the collection and I hope you will enjoy experiencing Prada at its best as much as I do!!! Enjoy!!! This is just a super quick post to portray how much I adore this outfit styled by Asos- they have mixed countryside fantasy with Coyboy style shorts- the combination works like a dream!! This whole outfit would be so great for summer and OMG can’t get over how super cool it looks, finished off with some rounded shades and gold bling!! 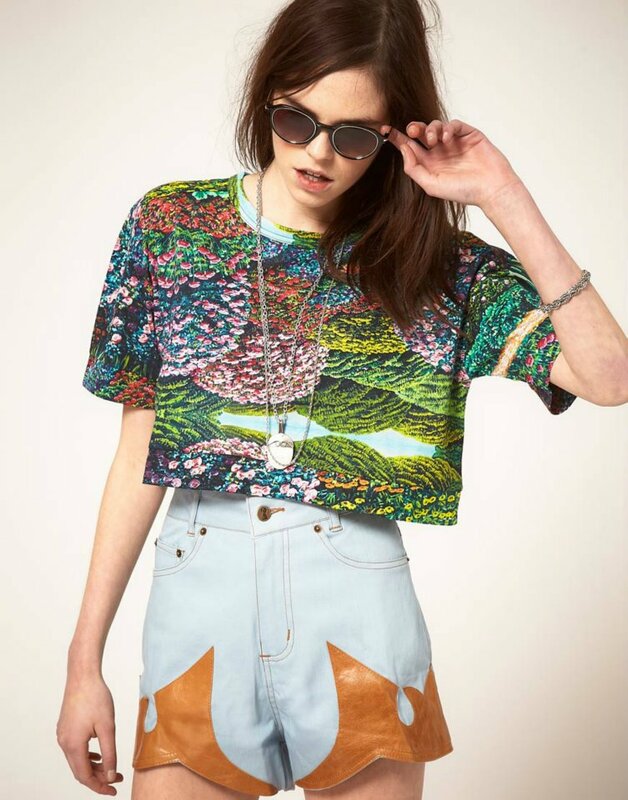 This t-shirt crop top is so striking- with green speeckled meadows, rose bushes, bliss. The overall pattern also reminds me a bit of some of Peter Pillotto’s current range with the small speckled patterns. Then- THE SHORTS!!! They are this delicate washed out denim which would still look lovely on their own, however then they have added this coyboy inspired shaped leather and stuck in on the bottom with a bit of scalloping. I think it might also resemble flames which reminds me of the gorgeous Prada flameshoes out now!! I love love love this outfit, I hope you do too!!! 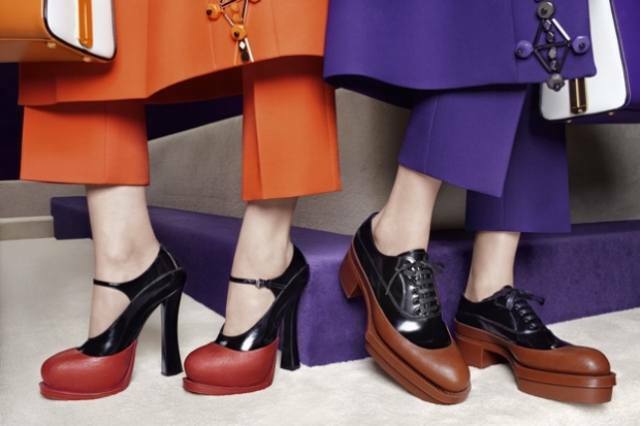 Prada’s current range is simply amazing. 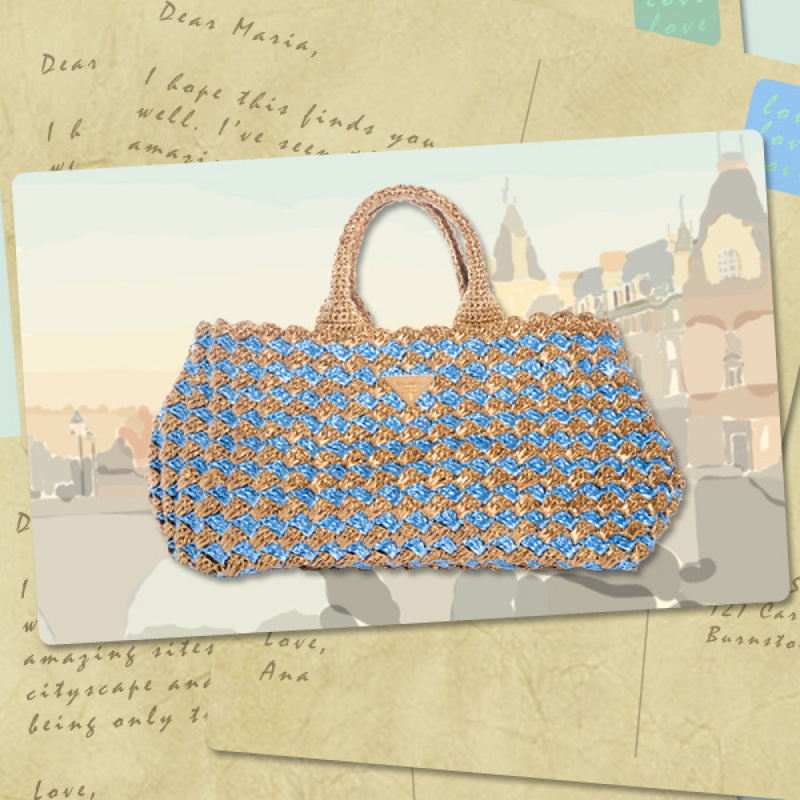 It is so imaginative and each garment or accesory is completely unique to the next. This post involves some picture of some of my favourite items. The first picture features a beautiful wide light brown coat with pink beading flowers, then she is holding an amazing lime clutch bag with a striking car design and gold clasp and she is wearing some trendy flame design pastel shoes and I have just noticed the red jet propellers- so quirky. The next picture is breat taking, the women are wearing pleated chiffon blue and yellow tops and they are holding a range of clutches with many bold designs on, these include- dice, lips, flames, cocktails, roses and cherries- wonderful! The third picture involves a luxury long coat with pastel textured flower pattern and yellow hand bag, the second is wearing a car design silk bandeau top with a pink satin skirt with layered yellow flowers and a green leather bag. 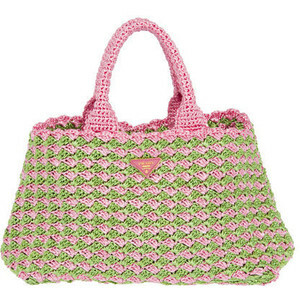 The last picture is of 2 beautiful swimsuits/bodysuits in the textured flower pattern with pink and green straw handbags= insanely CHIC!!! !